The Dalhousie is a hill station in Himachal Pradesh, established in 1854 by the British Empire's government in India as a summer retreat for its troops and officials. It is built on and around five hills, Kathalagh, Potreyn, Terah, Bakrota and Bhangora. Located on the western edge of the Dhauladhar mountain range of the Himalayas, it is surrounded by snow-capped peaks. Dalhousie is situated between 6,000 and 9,000 feet (2,700 m) above sea level. The best time to visit is in the summer, and the peak tourist season is from May to September. Scottish and Victorian architecture are prevalent in the bungalows and churches in the town. Day trip to Khajir, full day exploring Khajir (We will also go for a easy trek in conifer trails of Khajiar 5 to 6 km). Khajjiar sits on a small plateau with a small stream-fed lake in the middle that has been covered over with weeds. The hill station is surrounded by meadows and forests. It is about 6,500 feet (2,000 m) above sea level in the foothills of the Dhauladhar ranges of the Western Himalayas and peaks can be seen in the distance. It is part of the Kalatop Khajjiar Sanctuary. It has a rare combination of three ecosystems: lake, pasture and forest, it is also called the Mini Switzerland. The best entertainment in Khajjiar is to walk around the lake or to go for long walks in the thick pine forests. Children enjoy this place because of the freedom of movement and the sloped terrain which permits them to roll down to the lake without getting hurt. Another attraction is horse riding. Dense deodars, pines and lush green meadows are characteristic of Khajjiar. Since Khajjiar is situated at the base of the Dauladhar mountains, the tourists here can get panoramic views of the mountains. A little away from the lake is the temple of Khajji Nag belonging to the 12th century AD made by the king of chamba Preeti Singh . In the mandapa of the temple one can see the images of the Pandavas and the defeated Kaurvas hanging from the roof of the circumambulatory path. The sanctum of the temple has been beautifully carved from wood. This temple is dedicated to snake (Nāga) worship and there are some snake idols inside. 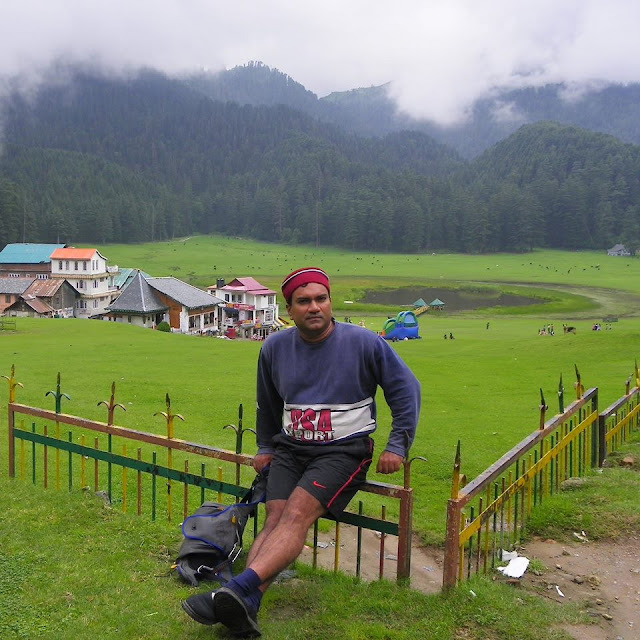 Khajjiar offers numerous trekking opportunities. Khajjiar to Dainkund is a 3.5 kilometre easy to moderate trek. The trek starts 6 kilometres from Khajjiar on the Dalhousie-Khajjiar road and ends at Pholani Devi Temple at Dainkund. 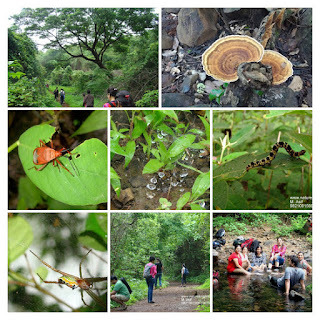 This trek with a well-defined trail and moderate ascent is an excellent trek for beginners and children. The trek offers excellent views and a beautiful camping site. Kalatop Khajjiar Sanctuary is a 30.69 km² animal sanctuary at Kalatop and Khajjiar in the Chamba district of Himachal Pradesh, India. The sanctuary area is well laid out for trekking trails both at Kalatop and Khajjiar. There is a dense deodar and fir forest covering 19.63 km² of the sanctuary, which is about 6 km from Dalhousie. Pheasants, serow and black bear are some of the common animals found here. The sanctuary lies in the path of the Ravi River, and is surrounded by coniferous and oak forests. The vegetation consists of blue pine and deodar forest, with oak. Undergrowth in the forest area is well developed. • Mammals- bear, Himalayan Black Marten, leopard, deer, Barking Goral, squirrel, serow, jackal, langur. Birds in this sanctuary many Birds are found some of them are listed below:- 1. Eurasian Jay 2. Whitewinged Black Bird 3. Black Headed Jay 4. Chesnut Billed Rock Thrush 5. Blackheaded Jay. 6. Grey Headed Cannery Flycatcher. Meals: Breakfast and Dinner at Dalhousie Hotel. Dalhousie is a gateway to the ancient Chamba Hill State, now Chamba District of the state of Himachal Pradesh of India. This hill region is a repository of ancient Hindu culture, art, temples, and handicrafts preserved under the longest-running single dynasty since the mid-6th century. Chamba is the hub of this culture. Bharmour, the ancient capital of this kingdom, is home to the Gaddi and Gujjar tribes. It has 84 ancient temples dating from the 7th–10th centuries AD. • Salooni about 50 km from Dalhousie provides a breathtaking view. Breakfast and Dinner at Dalhousie Hotel. 30% discount if the child wants seperate bedding. Site seeing by Tempo Traveller (Private) as per planned program. 13th Night and 18th Night in Volvo. May 18th Dinner not included. All Lunch and any other meals during travel not included. Tips/Shopping etc. cost not included. Any cost of Guides / Entry Fee into Forest Parks etc not included. Any cost due to change in program; vehicle breakdown; emergencies like road block; act of god; strikes etc. not included. Cost of Hotel/ Meals in Delhi if applicable Delhi not included. Cost of any room service; custom menu order; bottled water; beverages not part of hotel package. For Inquire call, sms or email.